Some of the Internet's most famous cats are lending a paw to an important cause: saving tigers from extinction. According to Greenpeace, there are only about 3,000 tigers left in the wild worldwide. "Their homes are being destroyed for such things as palm oil in Indonesia, coal in India and timber in Siberia," the organization's website says. 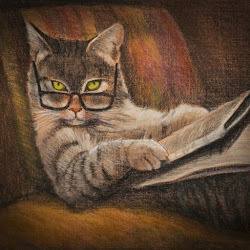 To support Greenpeace's work on the ground, Lil Bub, Princess Monster Truck, Venus the Two-Faced Cat, Hamilton the Hipster Cat, and Pudge all pounced on the opportunity to call attention to the plight of their huge relatives. 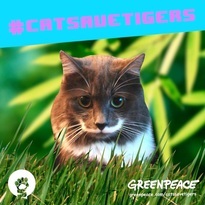 They're the stars of a video put together by Mr. President, a London-based advertising agency, as part of Greenpeace's Cats Save Tigers campaign. Would you and your cat like to get in on the action? You can create a Cats Save Tigers meme to share on Facebook or Twitter or upload an image to Instagram with the hashtag #CatsSaveTigers. So far, 6,181 cats have contributed pictures of their furry faces to the cause. Oh... make that 6,182. My cat, Sizzle, just uploaded his.